There’s plenty of beauty in director Julian Schnabel’s At Eternity’s Gate, a biography / drama about highly celebrated artist Vincent Van Gogh. The beauty lies first and foremost in the stunning cinematography, but also in the dialogue, editing and musical score. As a big fan of colour and light, there’s certainly plenty of it to take in and enjoy in Schabel’s movie; whether it’s the scenes in nature that Willem Dafoe’s Van Gogh is mesmerised by, or the beautiful blue of the jacket on the artist’s back. Thanks to Schabel’s great execution, I enjoyed At Eternity’s Gate in its entirety. Even the heartbreaking moments that highlighted the truth of just how challenging Van Gogh’s experience of life must have been. The moments of suffering he endured made me sad and simultaneously grateful that he, at the very least had one of the most loving brothers anyone could ever wish for. So engaging and immersive is the viewing experience of At Eternity’s Gate that it felt as though I was often there with Van Gogh; whether running with him through the beautiful vistas, laying down to take in the beauty of the sky and surrounding nature or even during his most tormented periods. Periods when there was next to zero colour in his days. Watch At Eternity’s Gate because you appreciate visual art. Watch it to learn some truths about Van Gogh and for the mesmerising footage of an artist at work. By the very end, you may even be inspired to take a trip to Amsterdam for the Van Gogh Museum; or perhaps pick up some paint and brushes. Time for me to look up Schnabel’s other films. At Eternity’s Gate is a Julian Schnabel directed biography that takes us inside the world and mind of a person who, despite skepticism, ridicule and illness, created some of the world’s most beloved and stunning works of art. If you hadn’t already guessed based on the above picture, the artist in question is of course, Vincent van Gogh who’s played by Willem Dafoe. Also starring Mads Mikkelsen, Oscar Isaac and Rupert Friend, At Eternity’s Gate features scenes based on Van Gogh’s letters, common agreement about events in his life that present as facts, hearsay, as well as purely invented moments. This trailer reminds me so much of how painful the lives of many great artists often are. ‘Maybe God made me a painter for people who aren’t born yet.’ Such heartbreaking words because of all that it could possibly mean. Definitely looking forward to this one and I’m quite sure that Dafoe and Mikkelsen will do a wonderful job in their roles. Read my spoiler free movie review of At Eternity’s Gate. I’m thinking that the much reported about re-shoots helped do the trick. I’m going to admit that I’m not very excited about this one. But then again, I’m still yet to watch a single Star Wars film. Reason being, fantasy generally isn’t my favourite genre. Nevertheless, I couldn’t help but notice that the teaser trailer makes this film look more ‘low budget’ than Star Wars – Episode 7- The Force Awakens. it may be because it is. Those who really love the franchise likely won’t agree, but I’m just thinking, isn’t this overkill? It still feels like The Force Awakens was released just yesterday. Instead of J.J. Abrams, Gareth Edwards is directing. Riz Ahmed, Jonathan Aris and Donnie Yen also star. Roger Moore was my favourite James Bond for a very long time, mainly because he’s the star of the first Bond film I ever watched. However, absolutely everything changed when my dear Mr Craig, Daniel Craig, came along. I didn’t care that at the time, most believed him to be the wrong choice. I was too busy being excited that radical change was finally coming. Especially since like many other fans, I had fallen out of love with what the Franchise had become prior to Casino Royale. Since Casino Royale is the very first James Bond book, one could surmise that finally, audiences would get an insight into what it was that really made Bond tick. The film certainly delivers in this regard and in several others including all the elements that makes for a great film. I.e. brilliant dialogue, to name just one. 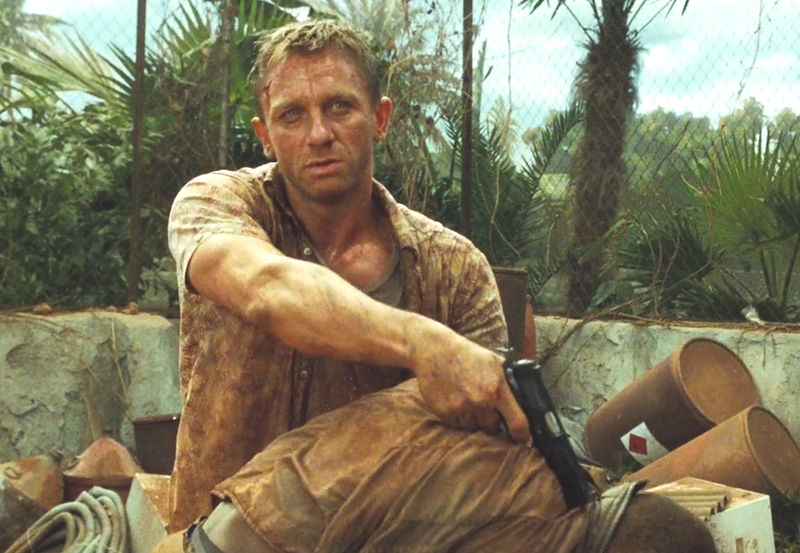 The unapologetic brute force of Craig’s Bond is a huge part of what makes Casino Royale such a memorable comeback for the franchise, and part of the reason why the film is my favourite Bond to date. I will not drop any spoilers for those yet to watch the film but I will say this: the first 20 minutes is brilliant, and you’ll be glad to learn that the rest of the movie continues as such. Have you seen it? If You know it’s the best don’t you?